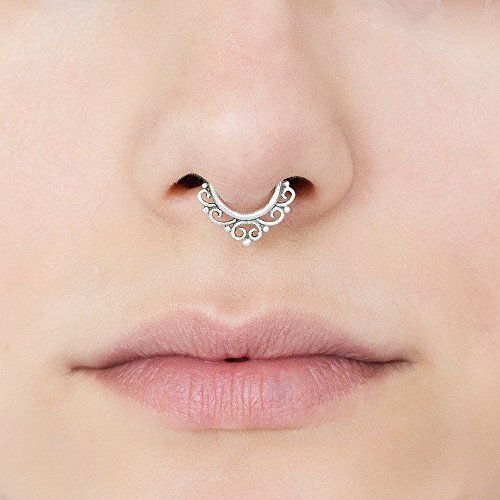 Septum ring is the perfect piercing jewelry for an up-to-date look. Express yourself and your style with this Indian, tribal design nose piercing jewelry, and add a personal statement to your authentic look and feel. This dainty handmade septum ring is made of 925 sterling silver, nickel-free and hypoallergenic. The ring can be worn as an earring for almost all piercing locations, and for earlobes as well. It's about time to choose jewelry that fits our personality and makes us feel free, special and fashionable. You are more than welcome to visit my shop for more jewelry designs. If you have any questions about this product by Umanative Design, contact us by completing and submitting the form below. If you are looking for a specif part number, please include it with your message.